Not so long ago, quite by accident, I came across “Quilting on a Budget,” a Facebook group of close to 22,000 members worldwide, dedicated to sharing “tips and tricks and advice on how to save money and just enjoy what we love to do.” I applied and was accepted as a new member. I’d found my tribe. This group warms my heart. The women members (yes, mostly women, from Equador to India to Iceland and the U.S. and beyond) are not interested in winning prizes at quilt shows or selling their quilts as works of art. They’re in it for love, not money. They make – and share photos of online – such simple, homey, lovingly made items as baby quilts for new grandchildren, lap quilts for ill sisters, bed quilts for friends’ wedding anniversaries, and jeans quilts for teenage sons. As the group’s name implies, they don’t spend a lot of money on fancy fabrics, choosing instead to save and use scraps from here and there, or tear up old clothes from which to piece their blocks. Many use flannel instead of expensive batting. Their results, we all agree, are charming. Yes, they share “tips and tricks,” but they also share, from time to time, personal stories that apply to their quilting lives, such as reports of recent back injuries or surgeries that have kept them from their sewing machines. Posts like these elicit outpourings of empathy, condolences and commiseration. Since patchwork quilting is known to be an addiction (a “positive addiction,” that is), everyone can feel for a fellow-member’s withdrawal. This is a support group. I’ve felt supported by it, too, especially since New Year’s Day when I fell backward onto my bathroom tile and injured my spine (see my recent “After the Fall” post). There’s nothing like knowing that you’re not alone to make you feel better about a painful situation. And, I believe deeply, there’s nothing like patchwork quilting to make a girl (I use the term advisedly) feel as if she’s sewing the worn, torn pieces of her life back together. 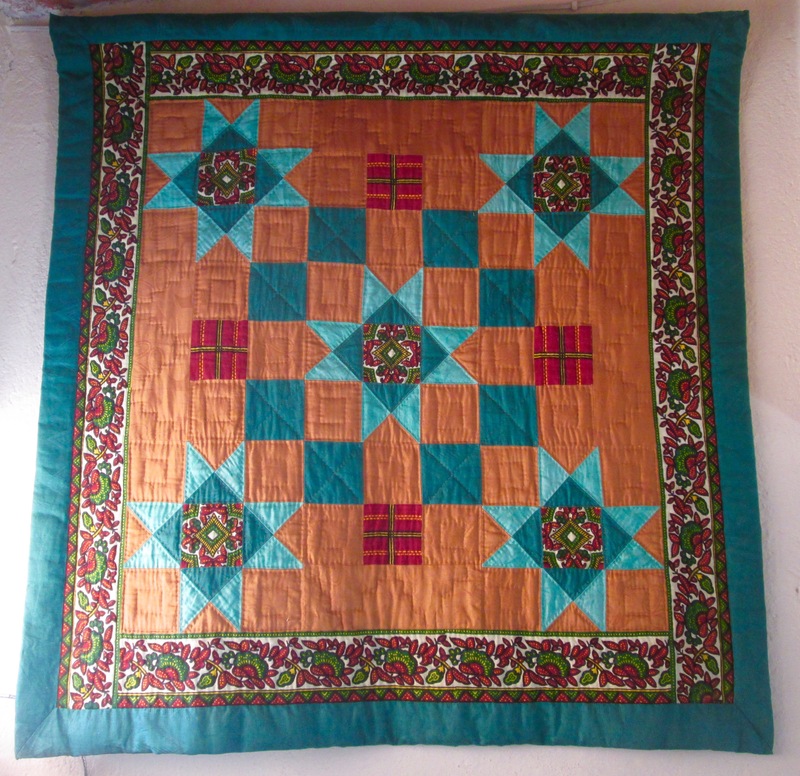 It’s quilting as metaphor, quilting as medicine, quilting as magic. The women in this Patchwork Project certainly learned how to quilt “on a budget” because all of us were far from rich. We used scraps of cotton fabric we gathered up from local tailors’ trimmings. We created nine-patch design tote bags, eight-point-star design wall hangings, wild-geese design baby quilts, and much, much more. The women loved it all, and I loved all of them. “I seldom gave much thought to my distant past, especially while in Mali, which was so far away from it all. But at times, when I was alone in the evenings sewing in my study, that past would creep up on me. “It had never been enough for me to BE: I’d always had to DO – make things that weren’t there before: words on blank paper, bread from my oven, now colorful fabric remnants stitched together to make something beautiful and new. In Mali, especially, I found that the joy these creations brought was healing. Wounds, it appears, can be patched. Torn hearts can be sewn. “I worked on this new wall quilt every night in my study, while listening to French language tapes. The tiny, precise quilting stitches taught me patience, as life in Africa in general teaches patience. Oh my, that was a lovely read! Bonnie your quilt is beautiful and the story was captivating. Beautiful Bonnie. You remind me of how my own passion — horseback riding — is a metaphor for me. It is freedom, daring me to let go and yet become evermore attuned to my perceptive equine partner. Abrazos. Thank you, dear Kim. Yes, we’re surrounded by metaphors! I love yours too (although I’m not a horseback rider). Abrazos back to you. A friend forwarded me this essay. I love your words and am inspired by your experience and perspective. I am a “fancy fabric” quilter (Kaffe Fassett), but also look forward to the day when I don’t select fabrics, I just grab and sew letting the design emerge on its own! Thank you. What a joy to hear from you, Alicia! Thank you for taking the time to comment. I’d so hoped that this post would find its way into the larger quilt community (or “sisterhood,” as I like to think of it). 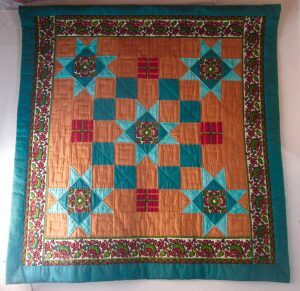 Best wishes for your own quilting, fancy or not. Art brings people together. I think women know that more instinctively than men. It’s what you did so often in Africa, and why it was such a mutually wonderful learning experience for all who were involved. Yes, Sonia dear, our respective experiences in Mali have sewn us together forever. Isn’t that wonderful? !